Have you ever wondered how push notifications impact app user retention rates? 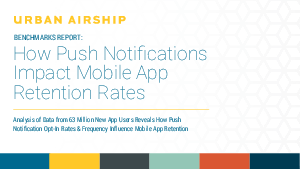 This first of its kind study analyzed the 90-days after first app open for 63 million new app users, comparing retention rates of those who received push notifications with those who did not. We uncovered surprising, and critical, insights as well as devised recommendations on how to keep users engaged and decrease user churn. This 61 page benchmark report is full of data points, insights and recommendations. Insights on the data specific to four key verticals - retail, media, sports & recreation and utility & productivity.